Fc gamma RII/RIII (CD32/CD16) in Mouse Splenocytes. 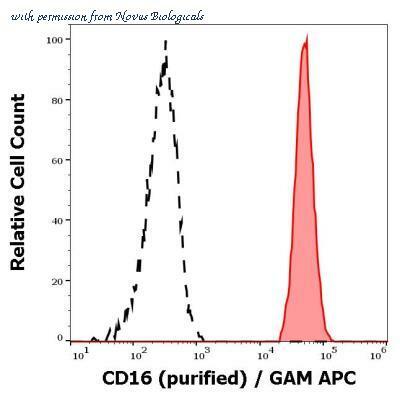 Fc gamma RII/RIII (CD32/CD16) was detected in immersion fixed mouse splenocytes using Goat Anti-Mouse Fc gamma RII/RIII (CD32/CD16) Antigen Affinity-purified Polyclonal Antibody (Catalog # AF1460) at 15 ╡g/mL for 3 hours at room temperature. Cells were stained using the NorthernLightsÖ 557-conjugated Anti-Goat IgG Secondary Antibody (red; Catalog # NL001 ) and counterstained with DAPI (blue). Specific staining was localized to cytoplasm. View our protocol for Fluorescent ICC Staining of Non-adherent Cells . Figure A. RPE conjugated mouse anti human CD3 ( MCA463PE ) and Alexa®647 conjugated Mouse IgG1 isotype control ( MCA928A647 ). Figure B. RPE conjugated mouse anti human CD3 ( MCA463PE ) and Alexa®647 conjugated mouse anti human CD16 ( MCA1193A647 ). All experiments performed on red cell lysed human peripheral blood gated on lymphocytes in the presence of Human SeroBlock ( BUF070A ). FCGR3A monoclonal antibody (M03), clone 2B11. Western Blot analysis of FCGR3A expression in Jurkat. 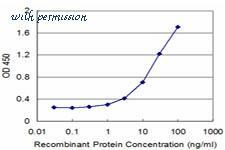 Detection limit for recombinant GST tagged FCGR3A is approximately 1 ng/ml as a capture antibody. Western blot of recombinant FCGR3A / CD16A. This image was taken for the unconjugated form of this product. Other forms have not been tested. 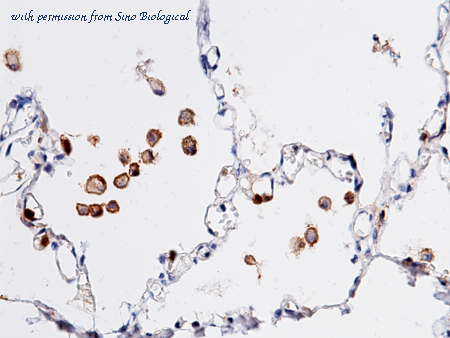 Immunochemical staining of human CD16b(a&b) in human lung with mouse monoclonal antibody (15 µg/mL, formalin-fixed paraffin embedded sections). 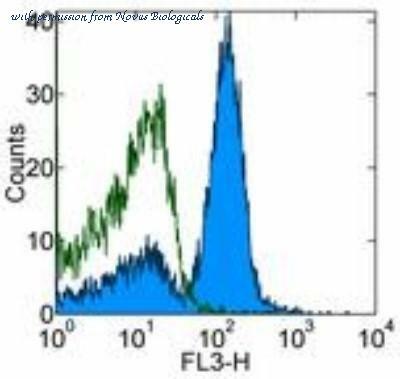 Flow Cytometry: CD16/CD32 Antibody (93) [NBP1-27946] - Analysis using the PerCP/Cy5.5 conjugate of NBP1-27946. Staining of BALB/c splenocytes with 0.06 ug of Rat IgG2a K Isotype Control PerCP-Cy5.5 (open histogram) or 0.06 ug of Anti-Mouse CD16/CD32 PerCP-Cy5.5 (filled histogram). Total viable cells were used for analysis. 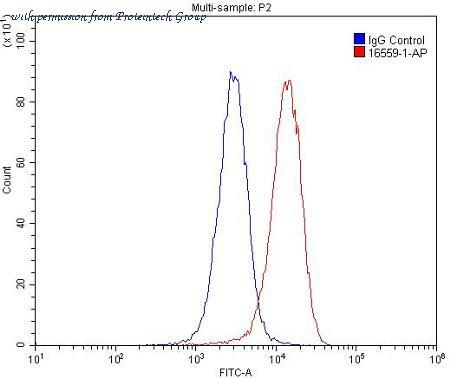 Flow Cytometry: Fc gamma RIIIA/CD16a Antibody (3G8) [NBP1-50056] - Surface staining of CD16 in human peripheral blood with anti-CD16 (3G8) purified/ GAM-APC. 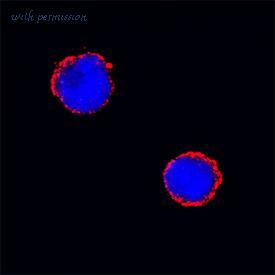 Flow Cytometry: Fc gamma RIII (CD16) Antibody (MEM-154) [NB500-378] - Staining of human peripheral blood cells with anti-human CD16 (MEM-154) purified, GAM/APC. 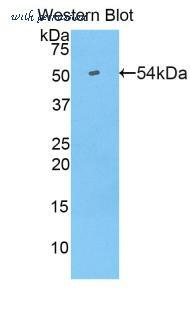 The CD16 antibody from Proteintech is a rabbit polyclonal antibody to a recombinant protein of human CD16. This antibody recognizes human antigen. 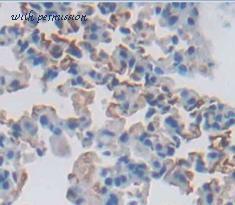 The CD16 antibody has been validated for the following applications: ELISA, IHC, WB, FC analysis.